Our basic requirement is to change name the 'Latest Start Date' field to 'ABCD' in people Screen. Remember this name change should only be applicable for persons who are using 'UK HRMS Manager'. a) Now open the people & Assignment form from the navigator menu. Click on the 'Latest Start Date field'. Now go to Help >> Diagnostics >> Properties >> Item. It will display the 'Object Properties' window. 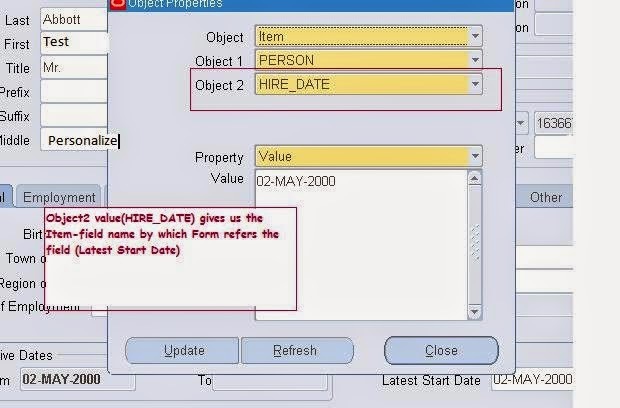 Note Down the Object2 value (HIRE_DATE) which is nothing but the name of the item. Condition TabSeq:- Next highest available number. ** Depending on the Trigger Event, this field may be Disabled, or Enabled and Required in which case it will validate against a List of Values. 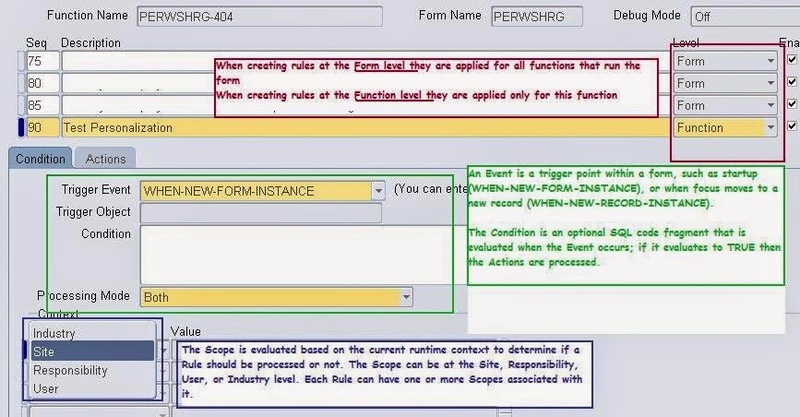 For example, if Trigger Event WHEN-NEW-ITEM-INSTANCE is selected, then we must enter a specific block.field for that trigger to be processed.